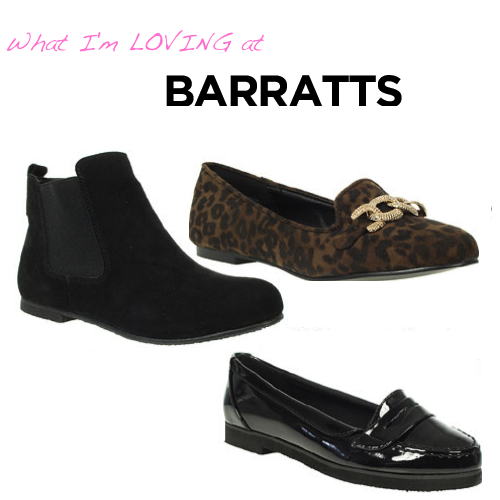 This is my entry for an amazing chance to win £100 to spend at Barratts which is amazing since they have so many fab shoes and boots to choose from. Here's just 3 pairs of shoes that I absolutely LOVE! First of all these Chelsea boots ! As you will all know I'm a huge fan of Chelsea boots and i've bought pair after pair of them! I really like these as they are suede and I think that they would look lush with a pair of skinny jeans or with a nice skater skirt and a jumper. You can get these for only £35 on the Barratts website. Next up is these Leopard slipper style shoes- I love leopard print and I really cant get enough of how easy it is to wear- I pop a leopard belt on and wear leopard shoes with so many outfits and just love how nice these are. I really like the gold chain that makes them look more glamourous. And last but not least I think everyone should own a pair of loafers - I have a tan pair and i'd love to get my hands on this patent black pair. They would go with everything! They are so versatile and I think they look smart but would dress up a pair of skinny jeans and for £15.30 they are a steal !